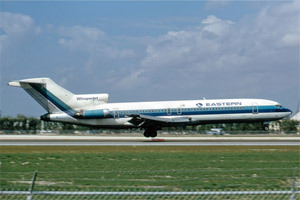 On June 24, 1975, at 1605 Eastern Daylight Time (EDT), Eastern Airlines Flight 66, a Boeing 727, approaching to land at New York's John F. Kennedy International Airport runway 22L, encountered adverse winds and heavy rain associated with a very strong thunderstorm. The winds resulted in a high descent rate, and the aircraft impacted the approach light towers short of the intended runway. The aircraft caught fire and came to rest on a highway, just north of the runway threshold. The impact sequence and resultant fire destroyed the aircraft. Of the 124 persons aboard, 113 passengers and crewmembers died in the crash. which is a concentrated downburst that affects an area 4 km (2.5 mi) in diameter, or less, and can generate winds in excess of 160 mph. Following the accident, subsequent research resulted in the development and deployment of the Low Level Windshear Alert System (LLWAS) at over 100 airports over the next decade.